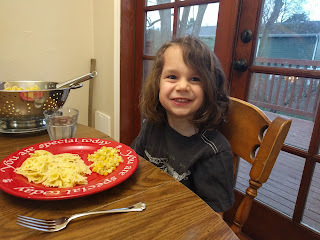 Mal turned five recently, which is somewhat startling to me since Gareth was turning five when Mal was born, and that doesn't feel like all that long ago. He was extremely excited for his day. He got to take in cupcakes to school and picked the ones that were spring themed, with flower rings. He wanted pasta for dinner, so we had that and some corn. 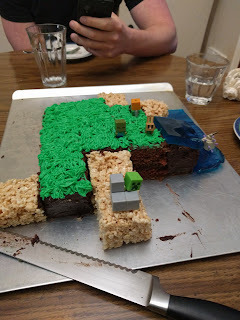 And then he wanted a Minecraft landscape cake, like Gareth had last year. I was even less meticulous this year, but he was happy with it. 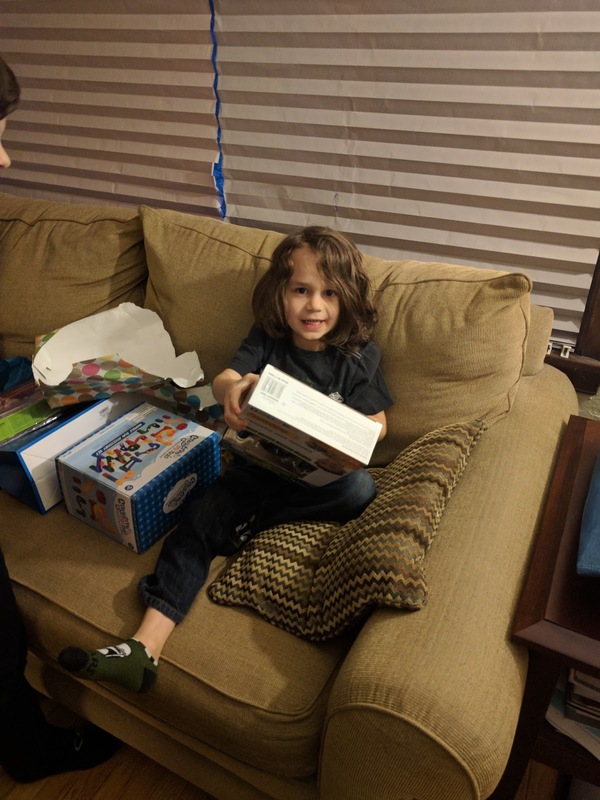 Then he got to open presents before bed. 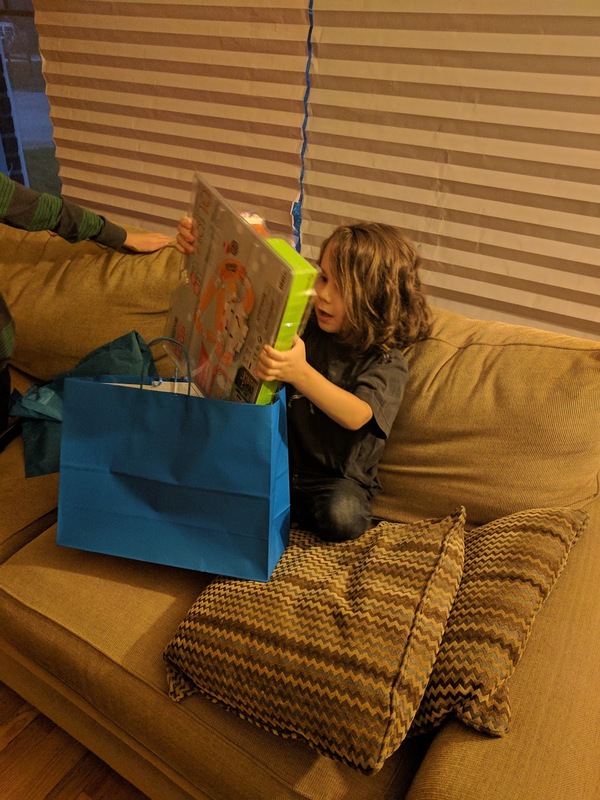 One of his preK teachers got him a present, which he was very excited to open. 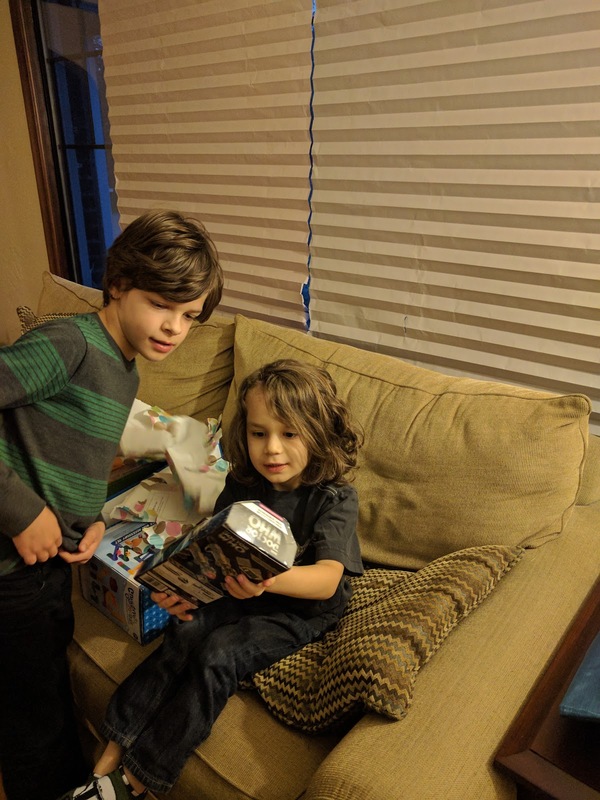 We gave him some marble run accessories and a sonic screwdriver (which actually came from a cohort friend who had gotten it in a box she won at comic con. She knew the kids were into Dr. Who, so passed it on just in time for Mal's birthday. 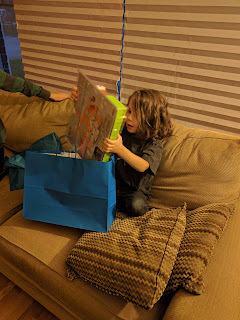 He was also very excited about some new books, Nightmare Before Christmas, and a camera. I made him wait until the next day to put together his gift from his teacher. 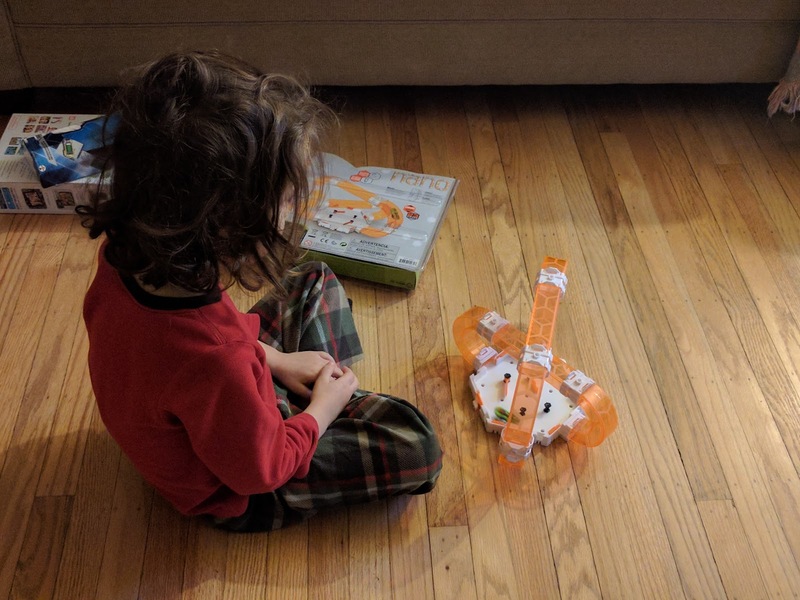 He sat there watching the hexbug climb through the tunnels for a good half hour the next morning. Although he was very excited about being five, he's actually in an anti-growing-up stage at the moment. He often insists that he isn't growing up. And the other day the doctor mentioned that his feet were huge (they have always been long and skinny, which both the doctor and I commented on) and that he was going to be a giant. He spent the rest of the day periodically checking in, asking, "Am I not going to turn into a giant?". When we ask if he's our baby-babes, he'll still usually say yes. He's still as stubborn/determined as ever, which makes me a tad anxious about Kindergarten next year. Only recently has he begun recognizing several letters; I think he can write three of them. He's not putting sounds to them yet, that I know of anyway. He can, however, recite the entire opening sequence of Star Trek: The Next Generation and pair soundtracks with movie titles within a bar or two, or recognize what yogurt his babysitter bought two years ago - he's got an amazing memory. But he only seems to remember what he chooses to, and if he's not interested in doing/learning something, it's incredibly difficult to get him to do it. School might be a very interesting journey with Mal. He likes to "joke" right now. Often he'll come up and tell you something ridiculous or pretend he broke something and then say, "I'm just joking!". He's not biking yet - we need to get him out on the balance bike more. He's such a cautious kid that getting him on a pedal bike could take a while, despite his love for them. He's also playing with his imagination a lot more recently (which probably goes along with the joking phase), so it's fun to hear what he comes up with. I'm looking forward to seeing how he grows over this next year.